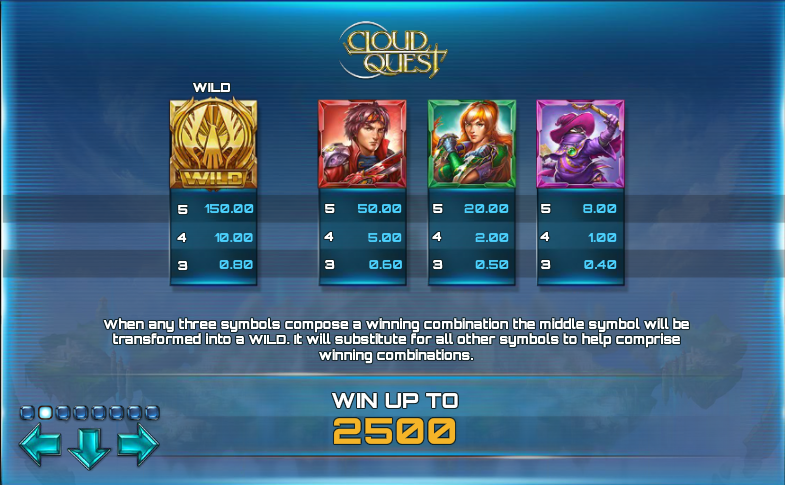 If you’re looking for something a little different then this fantasy-themed online slot from Play N Go might be right up your street; it’s called Cloud Quest and we’d probably class it as an arcade game although it contains elements of various genres. It’s loaded with extra features and it’s all explained below. 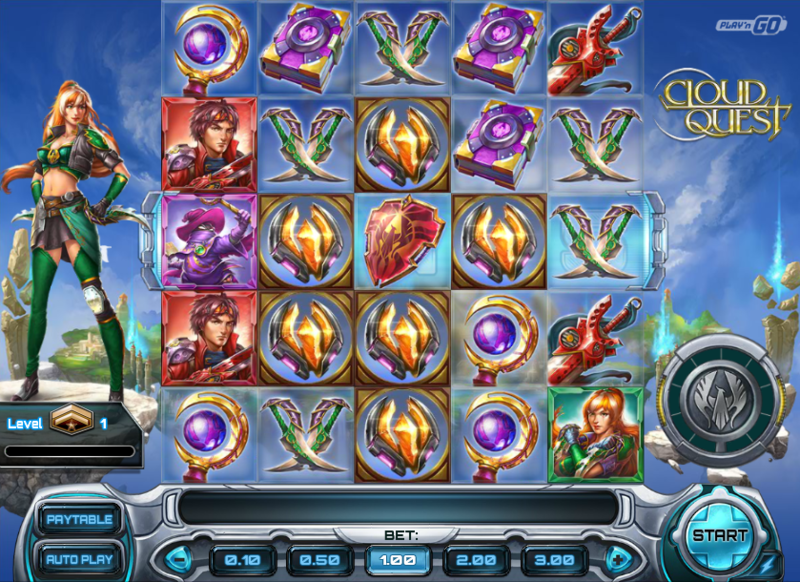 Cloud Quest is played on a 5×5 grid of symbols through which we can see various stone islands floating in the sky; one of the game’s three characters stands to the left of the reels, occasionally swinging his sword. The base game symbols include the three main characters along with a range of fantasy items – swords, potions, spell books, shields and the like. The wild is represented by a golden eagle and substitutes for all other symbols; there’s also a power stone which triggers the Super Power Respins. Winning combinations are formed by landing three or more matching symbols horizontally, vertically or diagonally. The centre symbol of each combo will turn into a wild and the rest will disappear, allowing those above to fall into their place. New combos are formed in this way and with the help of the newly created wild symbols. On each base game spin the word ‘bonus’ appears behind one particular row; if that row is completely cleared by winning combos then the feature is triggered. You will now play a three reel slot (as you can see from the video above) in an attempt to defeat your opponent with up to 20 free spins awarded. Damage is done to your opponent when you land a winning combo (or three of the target symbols) and if he’s defeated you move on to the next stage with three extra spins. Each monster defeated helps you level up – the highest level is Titan. Cloud Quest is the best game we’ve played for ages; the gameplay design is superb, the graphics are excellent and the wins are frequent, if small. Some real though has gone into the bonus features and this is definitely one to check out – it has an RTP of 96.52%.